The author of the New York Times bestselling America’s Most Wanted Recipes series reveals the secrets to winning over your kids’ tummies with their favorite restaurant meals made in the comfort of your own kitchen! More than a million home chefs have devoured Ron Douglas’s ingenious copycat recipes. From desserts to low-calorie and grilled meals, he’s proven how simple and cost-effective it is to prepare mouthwatering restaurant dishes at home. In America’s Most Wanted Recipes Kids’ Menu, he shares the ingredients to more than 100 of the most frequently ordered dishes from the country’s most popular children’s menus: Buca di Beppo’s Cheese Manicotti, PF Chang’s Crispy Honey Chicken, Applebee’s Kids’ Mini Hamburger, Chili’s Cinnamon Apples, Così’s Mississippi Mud Pie, Friendly’s Chicken Quesadillas, Panera Bread’s Mac and Cheese, Uno Chicago Grill’s Safari Nuggets, and much, much more. Face it, we all know the best way to make sure our kids are eating right is to prepare their food at home. Restaurant meals are traditionally high in calories, sodium, and fat. The dishes featured in Kids’ Menu were selected and designed to be served as occasional treats and as a fun way to get the family together in the kitchen, comparing the copycat version against the original. By making these dishes at home, parents will have the opportunity to make them healthier by substituting different ingredients and cooking methods. That’s what Kids’ Menu provides. Also included is a section on children’s nutrition and advice on how to balance the foods they love with ingredients that are good for them. Be the ultimate “sneaky chef.” Prepare the meals your family loves, knowing you’re giving them the nutrition they need. America’s Most Wanted Recipes Kids’ Menu will help you save money (no more drive-thru!) and calories, while you indulge in good food and quality time with the people you love around the dinner table. It may surprise some of you, but I don’t actually spend all my time coming up with copycat recipes. By day, I manage and taste test and sit down at my desk to write things like this introduction. But the rest of my time and energy is spent being a dad. Right now the house is quiet. I’ve just dropped the kids off at camp, leaving me time to focus on this book, the latest in the America’s Most Wanted Recipes series, and reflect the special place it has in my heart. After five books and 1.2 million copies worldwide, I felt sure this one should feature dishes that kids love, that they look forward to eating when they dine out with their families. It was my son and daughter, after all, who inspired me to leave the corporate world years ago to become a cookbook author—to teach other parents around the world how to prepare the restaurant meals their families enjoy but in the warm comfort of their homes. I wanted to be the dad to my kids that I wished I’d had growing up. In 1971, there was a pretty young girl from a rough area of Queens, New York, named Sharon. Like many teenagers, Sharon started hanging out with the wrong crowd and made some poor decisions, one of which was succumbing to peer pressure that led to recreational drug use. At that time, New York City was a lot different than it is now. The streets were flooded with heroin, and the crime rate was one of the highest in the country. By the mid-70s an estimated 200,000 people abused heroin in New York City. Sharon’s drug use eventually led to heroin addiction as well. In 1972, her parents checked her in to a rehabilitation clinic in Harlem to get help. It was there that she met a handsome and charming young man from Yonkers named Ronald. Ronald’s reason for being in rehab was a bit different. He was a heroin user as well, but he was also a dealer. At that time, Ronald was involved in one of the biggest drug busts in Westchester County history with several mob-associated gangsters indicted. He pleaded down in court to being a user and got sentenced to attend rehab as part of his plea deal. Sharon and Ronald became good friends while in rehab and supported each other’s efforts to get clean. They eventually started dating and fell in love. It was a happy time for them. In April of 1974, they got married—she was only nineteen years old, and he was just twenty. In August of that same year, while expecting their first child, Ronald went missing for several days and Sharon could not get in contact with him. Ever since they had been together, he had never gone more than a day without at least calling her. She feared for the worst. A few days later, she got a call from the police informing her that Ronald had been found dead on a rooftop in Harlem. Evidently his past had caught up with him. When they found him, he was badly beaten and overdosed with heroin. It was thought to be a homicide, but police never discovered who did it. So there was Sharon, a nineteen-year-old, newly-wedded, pregnant mother who had just lost her husband. Life had dealt her a cruel blow. Six weeks later in October 1974, she gave birth to a baby boy whom she would name after her lost love, Ronald. If you haven’t guessed by now, Sharon is my mother, I am Ronald Jr., and this is how my life story began. Having been born in October 1974, I missed meeting my dad by about six weeks. My mother spent the early years of my life in a deep depression after losing her first love so suddenly. She relapsed into heavy drug use. Much of my childhood was spent living at my grandparents’ house without seeing my mom for days at a time. I would often sit by the window crying, waiting for her to come home. Statistically, I had a slim chance of succeeding in life. Neither genetics nor environment was on my side. The pain from my early years motivated me to never do drugs, and I promised myself that my kids would never have to go through what I did. Fast-forward to 2004. I married the love of my life, and my daughter, Nia, was born. I had a good job on Wall Street working for JPMorgan Chase and we had just bought our first home. Everything seemed perfect, but it wasn’t. I was working sixty to eighty hours a week and the only time I’d get to see my daughter was for an hour or so at night and on the weekends. The best part of my day was coming home and hearing her precious little voice yell out, “Daddy is home!” before she went to bed. I wanted to provide for her, but I felt like I was becoming the absentee dad I had vowed not to be. That was the realization I needed. 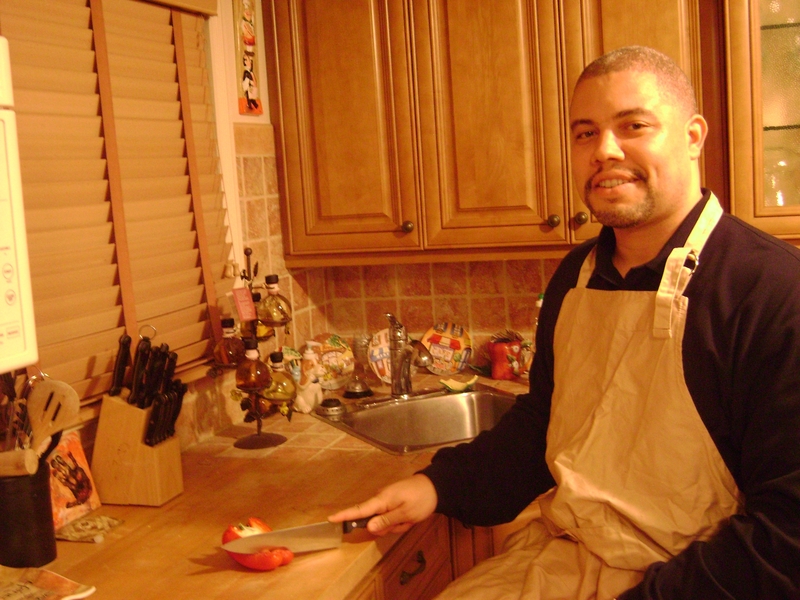 In 2007, a month before my son, Ryan, was born, I finally decided to leave the rat race for good and focus on RecipeSecrets.net and America’s Most Wanted Recipes full-time. Since then I’ve had the freedom to be home with the kids and play an active role in their lives. And if you’re wondering, my mother has cleaned up her act and is an awesome grandmother. She spoils them rotten, and our family bond has never been stronger. She has taught me what it’s like to overcome adversity and survive whatever hard times life sends your way. She was also my inspiration in the kitchen having shown me the fundamentals of cooking at an early age. 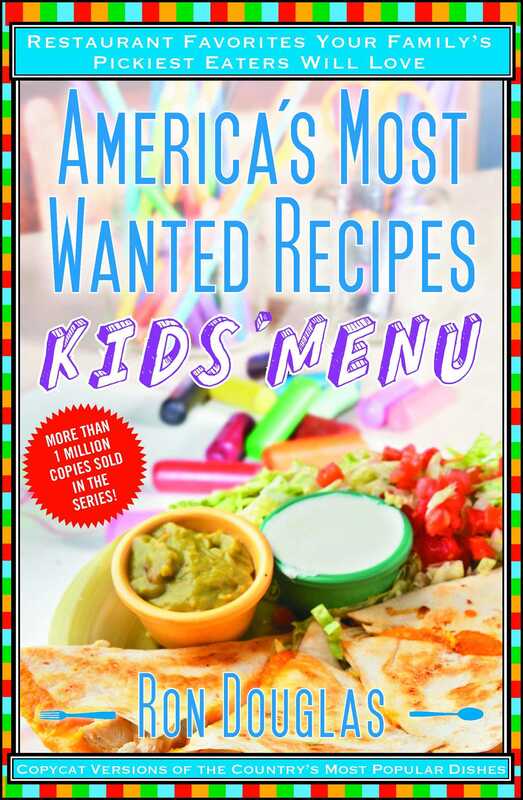 I truly hope that America’s Most Wanted Recipes Kids’ Menu, as well as the other books in the America’s Most Wanted Recipes series, brings you as much joy as it’s given me. This cookbook features 114 recipes inspired by the most popular kids’ menu dishes served in leading restaurants across the country, according to our market research, which includes poll data from RecipeSecrets.net members. Each recipe has been tested and tweaked to taste just like the original. Armed with these instructions, you can now skip the wait while eating out and impress your family and friends by making these dishes at home whenever you want. If you’ve read any of my other books or visited RecipeSecrets.net, you know that I’ve made a career out of creating copycat versions of popular restaurant dishes. They’re delicious, for sure, but not exactly health food. With childhood obesity growing at an alarming rate, I’d be remiss if I didn’t use this opportunity and the platform I have to provide some important information that parents can use to improve their kids’ eating habits. It is up to us as parents to regulate our children’s diets and to ensure that restaurant-style dishes are reserved for an occasional treat. The recipes in this cookbook are perfect for that purpose and are also fun to re-create at home and compare against the original version. As a responsible father of two young kids, I don’t recommend them as a part of your kids’ regular diet. The good news is, by making these dishes at home, you have the option to make them healthier by substituting different ingredients and cooking methods. I encourage you to read our Guide to Kids’ Nutrition on the following pages and to keep your kids’ health and development in mind as you enjoy these recipes. Ron Douglas is the New York Times bestselling author of the America’s Most Wanted Recipes series, which includes, most recently, America’s Most Wanted Recipes At the Grill. He is a former finance director at JP Morgan and founder of the #1 copycat recipe website, RecipeSecrets.net. He lives in New York with his wife and two children.